Deep groove ball bearings are used in a particularly wide variety of applications. 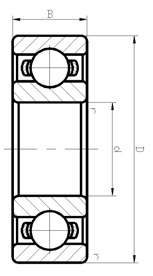 The 6000 Series, extra light bearings are normally used in applications where space limitations are a primary consideration and shaft sizes are relatively large. These miniature ball bearing are available in open, sealed or shielded configurations. Such miniature ball bearing structure is simple, easy to use, widely used. Mainly used for radial load to bear, but also bear certain axial loads. When increase its radial clearance, angular contact ball bearings with the nature, and can withstand greater axial loads. © 2009-2013 Ningbo U&J Bearing Co.,Ltd.